3 More Big Training Advantages – DeVry Tech Exclusive! with TRANSISTORIZED METER… PLUS NEW “MODULAR CIRCUITS” TO BUILD AT HOME! 1. METER – Transistorized, Portable, AC-DC Multimeter. 2. SCOPE — 5-inch New Streamlined Commercial-Type Oscilloscope. 3. ELECTRO-LAB* — For 3-Dimension Circuit Building. To help you get ready F-A-S-T-E-R . and THOROUGHLY … for good-paying job opportunities in the fast growing Electronics field, DeVry Technical Institute now presents the newest and finest training advantages in its over 30 years of experience. Now… AT HOME… in your spare time, you prepare with “industry-type” home laboratory equipment. To provide real PRACTICAL EXPERIENCE, you build a quality Transistorized Meter and a 5-inch industrial-type Oscilloscope . work with small, 3-dimensional circuits on DeVry’s new Design Console … use highly instructive home training movies… and follow up-to-date lessons with many time-saving fold-out diagram sheets. Little wonder DeVry men qualify for such fine opportunities in Space-Missile Electronics, Automation, Computer Work, Radio-TV, Industrial Controls, and other fields. You learn PRACTICAL techniques important in today’s Space Age industry, because you build many compact circuits with the streamlined Electro-Lab, using exclusive solderless “modular connectors.” You perform over 300 construction and test procedures in all! Your self-built test equipment has function-grouped controls, meter scales color-keyed to the panel markings-much like instruments used on today’s jobs. What’s so important, the home laboratory and the test equipment are YOURS TO KEEP! Through this remarkable 3-way method, DeVry Tech has helped thousands of ambitious men prepare for good jobs or their own profitable full-time or part-time service shops. It is the newest in a long series of PRACTICAL training aids that we have pioneered and developed in more than three decades of experience. Sound interesting? Then see how DeVry Tech may help YOU. Mail the coupon today. 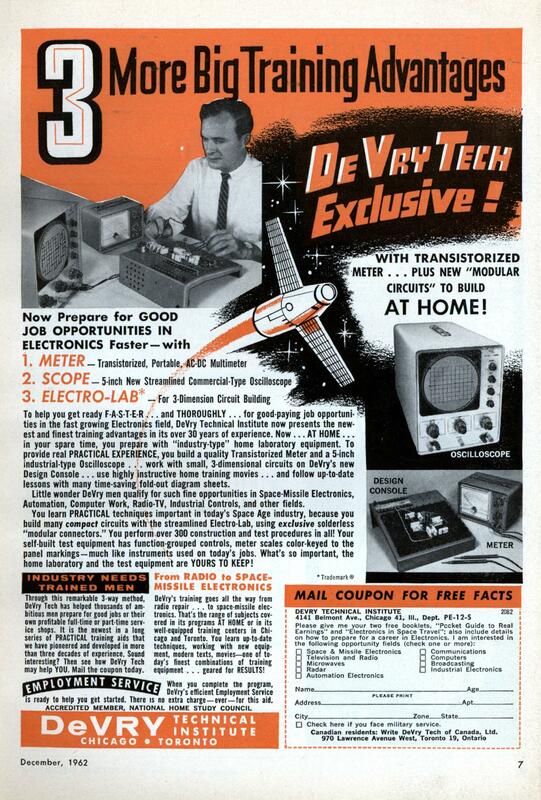 DeVry’s training goes all the way from radio repair … to space-missile electronics. That’s the range of subjects covered in its programs AT HOME or in its well-equipped training centers in Chicago and Toronto. You learn up-to-date techniques, working with new equipment, modern texts, movies—one of today’s finest combinations of training equipment . . . geared for RESULTS! When you complete the program, DeVry’s efficient Employment Service is ready to help you get started. There is no extra charge—ever—for this aid. Building your own oscilloscope sounds like fun. I presume they supplied the CRT and you put together the electronics. 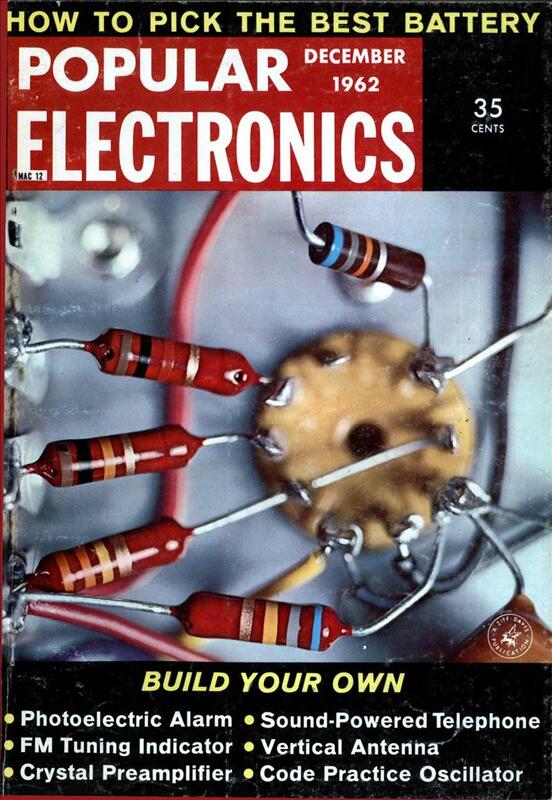 The high voltage circuits would be particularly exciting!